Two of Poland’s most spectacular sites, Krakow and Zakopane, are brought together in this holiday of contrasts. Firstly, the medieval UNESCO-listed university of Krakow, for centuries Poland’s capital, and hometown of both Chopin and Pope John Paul II. Your second base is Zakopane, Poland’s highest city, amidst the spectacular Tatra Mountains and situated 800m above sea level. Zakopane is famous for its unique wooden architecture, featuring pretty, wood-fronted, 19th century villas with high, sloped roofs! Your journey between Krakow and Zakopane will take a little longer than you might have expected – you will spend 2-3 hours gently meandering through the Dunajec River Gorge on rafts! This will allow you to fully appreciate the rocky landscapes of the Pieniny Mountains. (Note; the coach continues with your luggage – if weather conditions dictate, or if anyone prefers, the land route by coach may be used). Day One: Flight to Krakow. On arrival you meet our representative and transfer to your hotel in Krakow for three nights bed and breakfast accommodation. Days Two and Three: Included half day walking tour of Old Krakow, also known as Stare Miasto. There is also an optional afternoon excursion to the stunning Wieliczka Salt Mine. Walk 1: From Krakow there is also an included walking excursion. You travel by local bus for a 5-mile walk in the forested Ojcowski National Park, Poland’s smallest National Park, located 8 miles north of Krakow. Ascent and descent of 100m. Day Four: Today you travel to Zakopane, but instead of doing all the journey by road, you take 2-3 hours rafting gently through the stunning scenery of the Dunajec River Gorge, before arriving at Zakopane, in the heart of the Tatra Mountains. Four nights are spent here on a bed & breakfast basis. Days Five to Seven: In Zakopane, with two included guided walks. Walk 2: You take the local bus to walk through a glacial valley (Malej Laki) to Kondracka Pass, at a height of 1580m. You descend the valley towards Zakopane. The walk is 7 miles with a climb and descent of 400m each. Walk 3: You travel out of Zakopane by bus to start your walk near to the Slovakian border. The walk follows a trail through Hala Gasienicowa alpine meadow (1300m) and then back to Zakopane. The walk is about 8 miles and with 300m of ascent and 500m of descent. 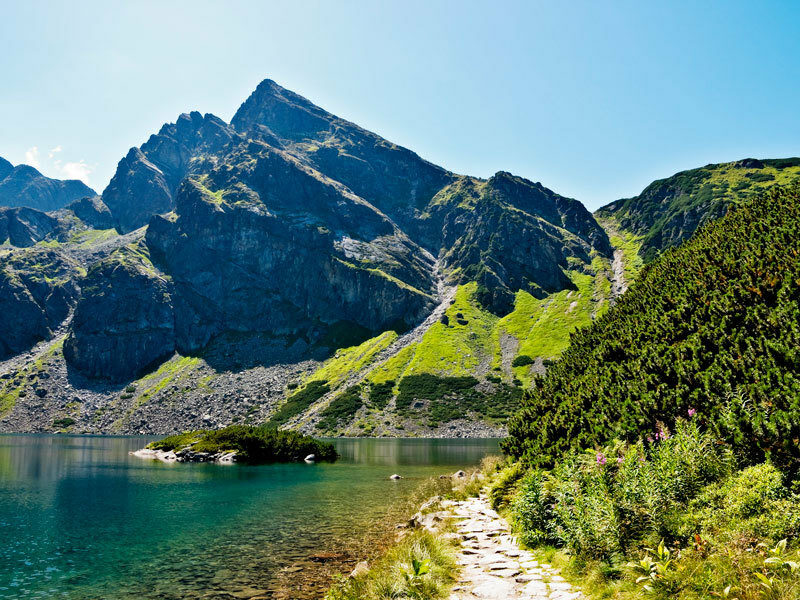 While staying in Zakopane you also have the opportunity to cross the border into Slovakia, Poland’s southern neighbour, on an optional excursion. The High Tatra Mountains straddle the Polish-Slovakian border, and you will be able to experience the fantastic scenery from a different perspective – the cable car from Stary Smokovec to the mountain town of Hrebienok, at an altitude of 1200m. There is the chance to take a walk along marked paths to the scenic waterfalls of the area. Day Eight: Free time until your departure transfer to the airport and your return flight home. Depending on flight times, there may be some time in Krakow en route to the airport. No Single Supplement on selected dates!